Azim was tired of hearing the same reply for the past few months. Each time he called the waste management authorities in an effort to find a solution for the piling garbage in his locality, he got either apathy or fake promises for a response. He became very pensive for a solution for this persistent problem of our society. That is when he, along with his friend Ning, decided to put an end to this inefficient and ineffective waste management system, in their own way. Ning R Manoj and Azim Zamaan of Rani Public School, Vadakara, started off by consulting various personnel and probing the root cause of the problem. They understood the gravity of the situation, reiterating to themselves that, improper waste management can lead to the spread of infectious diseases, soil degradation and water pollution. On the top of it, unhygienic workplace conditions of the garbage collectors was a glaring issue as well. They were on a relentless quest to find a solution to this problem. Ms Nidhu Krishna also joined their team. They brainstormed and poured in their ideas, and that is when, the automatic garbage truck(AGT) was born. The solution that they came up with, requires minimal human intervention and it collects garbage from residential sites in rural areas to dispose it off into a dumping site. 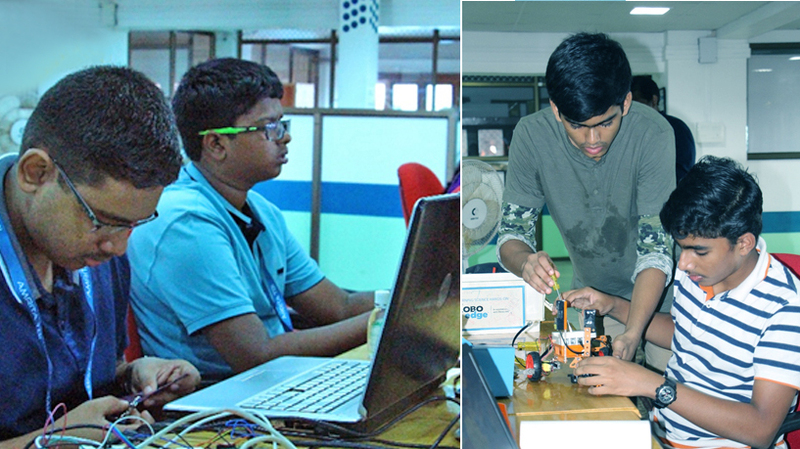 Their idea being selected for the Atal Tinkering Labs(ATL) marathon, came in as a big benefit. They were able to significantly improve the prototype and bring in refinement to their working model. Now, the team is steering towards its next version where the truck can automatically segregate reusable and non-reusable material. In the other part of the country, Advaith Gowrishetty, Manikanta Chavvakula and Manish Mallapur of Delhi Public School, Nacharam were burning midnight oil to find an effective solution for our farmers. The heart wrenching cases of farmer suicides in our country were pitifully calling out for a full-stop. The team was very clear on what they wanted to do. They had the grit and determination to zero in on a long term solution for the farmers. Along with their mentor Subhash M, they began with a survey among the farmers and took the essence of their findings to materialise farm tech- a multifunctional solution to tackle crop failures and ultimately put an end to the ‘death traps’ that dread our farmers. They built a Raspberry pi based computer that has a low power consumption rate. It has a rainfall sensor, temperature sensor, humidity sensor and soil moisture sensors integrated to it, powered by a solar panel. The team took the innovative idea one step further, by creating an app through which farmers can monitor their land from anywhere. This user-friendly, easy to use app is compatible on any android based device. The idea was so promising and encouraging that it was difficult not to be awed by the innovation of the students. No wonder NITI Aayog (National Institution for Transforming India) judging panel adjudged Delhi Public School to be the best among all the 650 teams across 25 states who participated in the challenge! 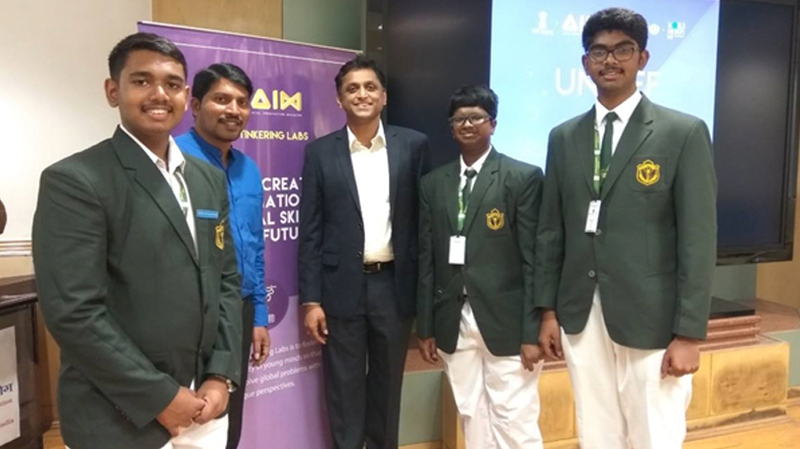 “We wanted students to take their ideas to the next level through our sessions and provide them with deeper insights into innovation and design thinking and help them build better solutions”, says Mr. Snehal Shetty, COO of Amrita TBI. 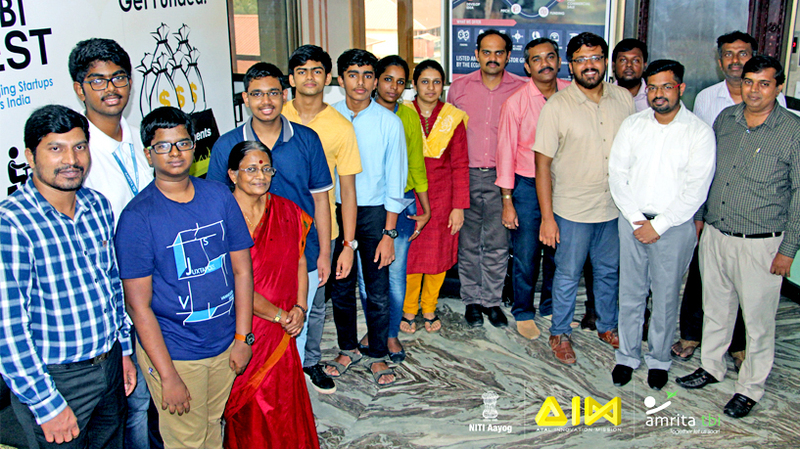 The brilliant minds of NITI Aayog –AIM schools underwent a week long workshop at Amrita Technology Business Incubator, Amritapuri. The workshop aimed at carving the best out of the future entrepreneurs. Each session/activity was tailored to take the students one step ahead of their final objective. The workshop was focused on listing out tools, creating a prototype plan , product design, and prototyping into an upgraded version. The workshop also provided the right ingredients of running a business, accounting, working on the business model and the intellectual property rights. There were pitch preparation sessions for the students as well. As a part of the workshop, the team also visited the ATL centre at Puthiyakavu, where they witnessed bubbling enthusiasm from the inquisitive minds of Amrita Vidyalayam.Students of class 9,10 and 11 actively participated in the interactive session with Amrita TBI to understand more about the journey of the entrepreneurs-to-be. During the demo of the prototype, questions were centered towards the robustness and effectiveness of the solution. Post the workshop, online sessions and mentorship support were provided to the teams remotely from Amrita TBI. The primary objective was to tweak the pitchdeck into a more professional version, and to discuss on their business model in detail. Emphasis was placed on bringing refinement to the value proposition offered, targeting the right customer segments, improving customer relationships, and tapping into the key activities for expanding as a startup. The students raved about the impact created by Amrita TBI and the positive influence the workshop had on them. “Amrita TBI motivated us to look beyond the solution and to have a more comprehensive outlook. Also, professors at Amrita were very helpful and I am very happy that we were able to improve our code in a single day and we are super inspired. “says Adhvaith, DPS, Nacharam. 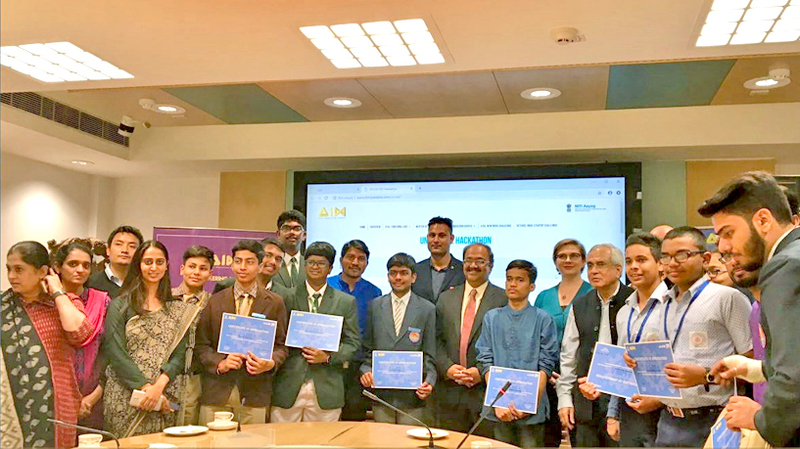 Delhi public school, Nacharam was among the six winning teams at UNICEF India ATL that won the award.